It's Real: I'm addicted...I had to go shorter! I can't help it I am loving the short, cropped do! 2008 is my year and I had to make some changes and my hair was one of them...I'll probably have platinum blonde by summer!!! You should never have to apologize for making yourself happy. I know you are working it so keep doing your thang honey. When you are ready for length again, it will take no time to grow back. I love it! It looks good! I'm loving the crop look! Hair looks nice. Face cute. Personality even cuter. I scrolled down and checked out your pics. Your hair was seriously long, I see. It still looks flyy to me. Your hair always looks good, and I love it now! You look so fly!!!! Do the dang ole thang!!! Girl you gonna start a chain reaction! I miss my braided bob cut days! Toooo cute! Thanks for sharing updates K! Your hair is so cute. 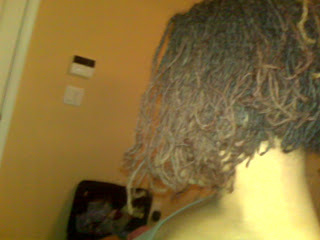 It shows that you can were sisterlocks any kind of way. Even a fierce bob like yours. Work it girl! Love the bob and your color - lots of variation in the tones. Check out the sisterlocks meetup in April - we would all love to meet you there. Your hair rocks! Totally edgy. I too would like a bob cut. A shoulder length, angled bob. Can you tell me please if you experienced any unravelling from your locks in the back or anywhere? If any, how long did it take to reseal the ends since you've already had it cut twice? Thanks for your reply. Audrey's pleasure - sorry it took me so long to respond. Yes, I have had unravelling but it is due to my texture and me trying to dye my own hair...not a good idea for someone who knows nothing about conditioning hair.